Hendrik Wessels (CA) is the Associate Director at PwC Kimberley, part of the global PwC network committed to delivering quality in assurance, advisory and tax services to their customers. Since using Receipt Bank, Hendrik and the team have given up the offsite storage units once used for storing paperwork. Now they are enjoying improved data accuracy and increased profitability. 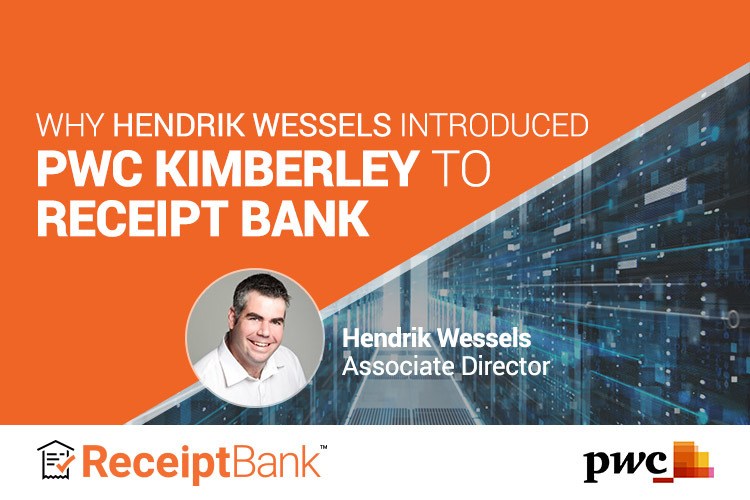 Here’s why Hendrik returned to using Receipt Bank for PwC after using it for his family-run business last year, and the four challenges he set out to solve. Hendrik first discovered Receipt Bank in 2012. The first challenge was how to securely store all that client paperwork. Around 80% of Hendrik’s clients work in farming. To test the accuracy of Receipt Bank compared to their traditional manual system, Hendrik and his team ran an A/B test. Now, Hendrik and team are switching to a long-term mindset when recruiting. “Now, we want more people to stay more permanently so we can continue training with Receipt Bank without losing the effectiveness. We now appoint people who have just finished grade twelve. They start working here to work up the system,” says Hendrik. One of Hendrik’s favourite features is Bank Statement Extraction, the ability to turn statements into actionable data automatically. With the time-saving, Hendrik can now allocate his staff a larger client-base to look after. The time-savings and profitability extends to Hendrik’s clients. Hendrik and the team are using technology to build more quality client time into their services, and live true to PwC’s mission: to help businesses and individuals create the value they’re looking for.